The European Water Framework Directive addresses the issue of pollution from urban waste water and is thereby changing the scope of sewage treatment. As part of this process, the Neptune project (EU, FP6) focuses on developing new and upgrading existing technologies of waste water and sludge treatment for municipal waste water. A special focus area in Neptune is sludge handling because the sludge amount is expected to increase due to advanced waste water treatment. The main sludge processing methods assessed in Neptune can be divided into two categories: disintegration processes before anaerobic digestion (thermal hydrolysis and ultrasound disintegration) and inertisation processes performed at high temperatures (incineration, pyrolysis, gasification, wet oxidation) but they all aim at volume reduction and removal of biodegradable compounds before safe sludge disposal or reuse of its resources. As part of a sustainability assessment (or “best practice evaluation”), a comparison between the existing and new sludge handling techniques have been done by use of life cycle assessment (LCA).The concept of induced impacts as compared to avoided impacts when introducing a new sludge treatment technology is used for the environmental comparison. Emissions from the treatment of the sludge as well as energy consumption and production, chemical consumption, infrastructures and transport are taken into account. 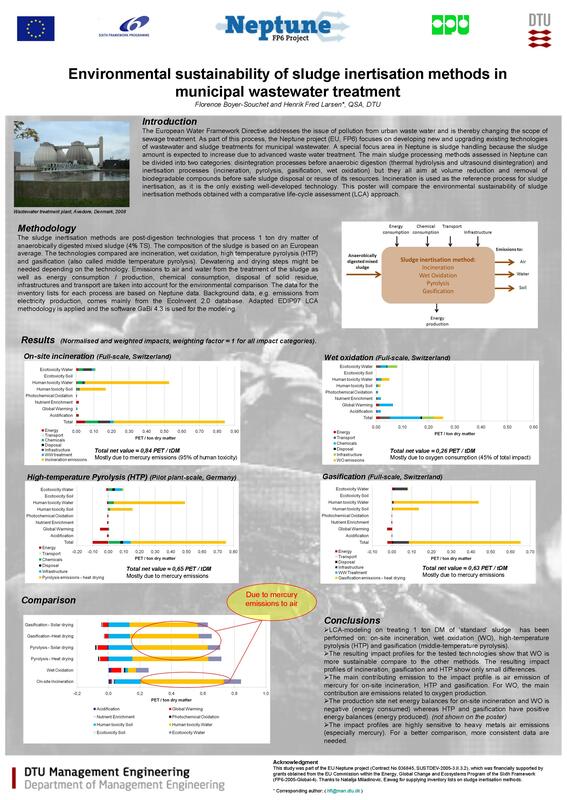 This poster will present the results of LCA’s performed on different inertisation technologies. Incineration is used as the reference process, as it is the only existing well-developed technology, while other techniques like pyrolysis and gasification are relatively new, and only exist at lab-scale or pilot-plant scale.